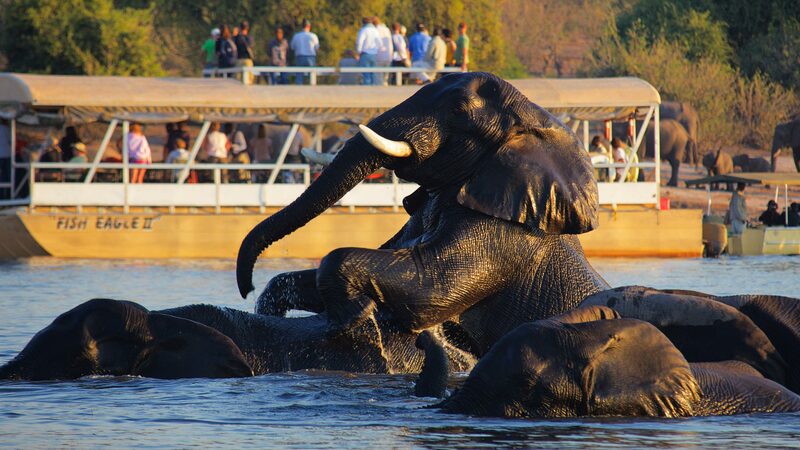 Most visitors go to Chobe National Park for its famous dry-season game viewing. From May to the end of October/early November, ever-increasing numbers of water-dependent animals (especially elephants and buffalo) are concentrated along the Chobe River as well as in the park’s central Savuti region. Chobe Safari lodge borders the Chobe National Park. The Lodge is situated in Kasane town in Botswana. The park entrance gate is a 10-minute drive from the lodge. Accommodation is offered in various levels from luxury rooms to camping. 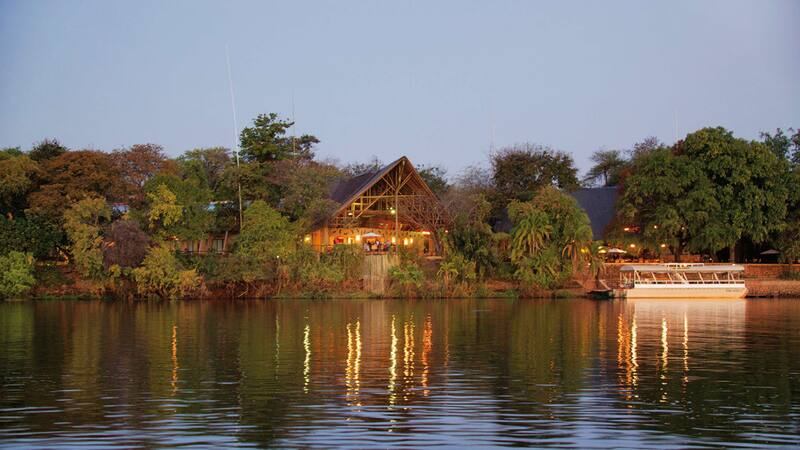 The lodge is situated on the Chobe River and all rooms have wonderful views of the river. The restaurant serves a la carte as well as buffet style meals. The cocktail bar and pool areas are most welcoming. The location of Chobe Safari Lodge is perfect for any safari traveller or visitors in Botswana. Great location to launch your game drives and boat trips in the Chobe National Park. Chobe Safari Lodge offers a range of accommodation that caters for all needs. For the adventurous 4×4 self drive clients there is individual sites scattered amongst the riverine forest. The original accommodation option at the Lodge – the 8 Rondavels, are independently positioned to the west of the main complex. 46 luxury Safari Rooms are the newest addition to the accommodation offering. In addition to the standard en suite facilities and air conditioning, each rooms has its own patio that leads out onto the expansive lawns which form the banks of the Chobe river. The 22 luxury River Rooms each have two double beds and ideal for families. Enjoy the indigenous and rich flavours of Africa in the main restaurant. The concept restaurant serves mainly buffet style meals with dinners spoiled for choice with its variety and selection. The dinner buffet often includes exotic game meats, roasts, barbecues, stir-fries, Indian cuisine and vegetarian dishes. A highlight to any stay is a dinner cruise aboard one of the lodge’s boats whilst cruising on the Chobe River between the shores of Botswana and Namibia. Chobe Safari Lodge is situated next to the renowned Chobe National Park. The Park boasts one of the largest concentrations of elephant in Africa. The game drives and boat cruises on offer from the lodge allow guests to witness this amazing spectacle. Other activities that can be arranged in the area include Victoria Falls day trip, fishing, scenic flights and Namibian village walks. 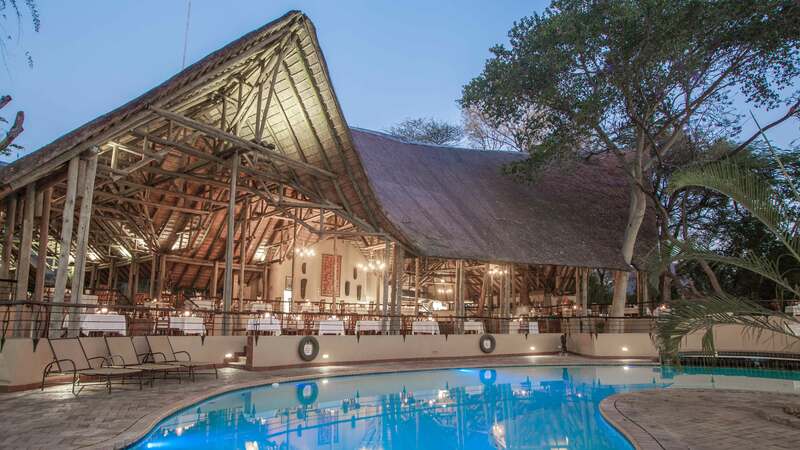 Chobe Safari Lodge offers an excellent getaway location to Chobe, Victoria Falls or Caprivi, great value for money.